The north end of Silicon Valley is known for its decades of academic and industrial innovation, much of it in electronics and medicine. 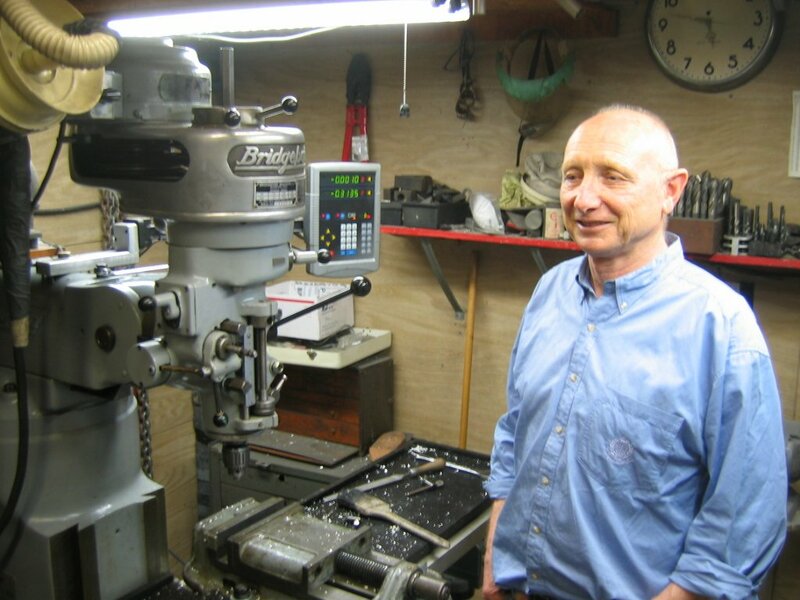 There is also a thriving community of less visible inventors, experimenters and DIYers -- and one of the active, very creative members of this segment is Bob Schneeveis, a resident of Midtown. For pay, Bob, 64, works at Stanford Medical Center, crafting by hand truly unique machined instruments for researchers -- tools that help them to see and/or measure small things happening in nerve systems, vision, and others. He grew up in Wisconsin; his family was in what would today be called the "recycling" business, but in those days the term "junk dealer" was more common. By the age of 16, Bob was speeding amotorcycle on back country roads, and had found pleasure and skill in using his hands with tools and machines The U.S. Coast Guard sent Bob to helicopter mechanic school at the Sikorsky plant in Connecticut. Bob became the chief mechanic for the San Francisco squadron of Coast Guard choppers. It's a job where you really have to know about electricity, hydraulics, metal, mechanics, communications -- everything. During his service, when the Coast Guard was called for rescue of sailors whose boat was thrashing dangerously in stormy wind and water, Bob was also a guy on the low end of a cable suspended from a helicopter, reeling the people up to safety. His knowledge, experience and modest confidence are evident in the relaxed, smiling manner in which he talks. Bob's garage has a small set of power tools for cutting metal, welding, threading, assembly, disassembly, again and again. For decades, Bob has been particularly interested in electric-powered transportation. In 1993, Bob and over a dozen friends built an all- electric race car, and came in second in races on the Indy-type track in Phoenix. 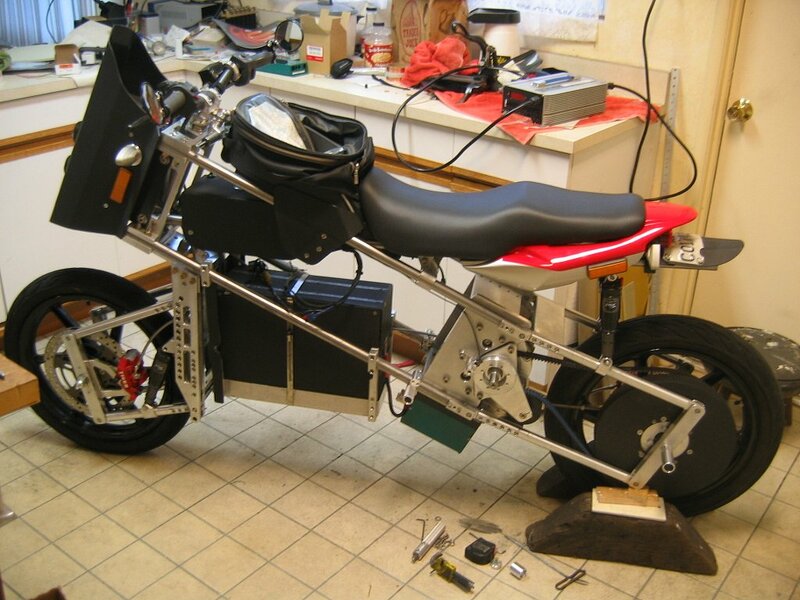 At his home in the northeast corner of the Midtown area, one current project is an all-electric motorcycle. For full disclosure: the author of this article has been a friend and admirer of Bob Schneeveis for over 15 years. I have ridden that motorcycle. It's a dream. Quiet, smooth... I want one. Bob's son Kent lives in College Terrace and at one time made and sold compost bins at the California Avenue Farmer's Market, made of recycled redwood fencing. (I own one). Bob also has a daughter living in Colorado. If you see a somewhat unusual vehicle around Midtown or elsewhere, there is a good chance it is our clever neighbor Bob, continuing on his never-ending learning curve.